Although recent studies have focused on life-sustaining treatment (LST) decision-making by families, research has not examined such decision-making as an aspect of ongoing caregiving by family caregivers. This article focuses on factors associated with family caregiver role strain and ease in LST decision-making. Using content analysis, factors were derived from interview data gathered from 17 family caregivers who had made LST decisions for 16 elderly ill relatives. The factors are incorporated in a framework, The Family Caregiving Process in Making LST Decisions for Elderly III Relatives, and fall under four key roles-caregiver, elderly ill relative, other family members, and health care providers. Factors affecting the strain and ease felt by family caregivers exist not only during the actual decision-making period, but also arise during the days, months, and years prior to the event and continue on after the LST decisions have been made. Nurses' knowledge of these factors can help nurses decrease family caregiver strain and increase ease during the family caregiver LST decision-making process. The number of families involved in making decisions about lifesustaining treatments (LSTs) for elderly ill relatives will increase markedly in the coming decades. According to the Census Bureau's projections, the number of individuals 65 and older will more than double by the year 2050, to 80 million (U.S. Department of Commerce Economics and Statistics Administration, 1996). The number of elderly individuals experiencing multiple chronic illnesses, cognitive impairment, disability, and dependence will also increase, as will advances in LST technology. Although a great deal of research has been conducted on the experiences of family caregivers, the studies have focused primarily on family care in the home for elderly individuals with chronic illnesses such as Alzheimer's disease (Kuhlman, "Wilson, Hutchinson, & Wallhagen, 1991), Parkinson's disease (Edwards & Scheetz, 2002), cancer (Schumacher, 1996), and stroke (Grant, 1996). Some studies have examined family caregiving in long-term care facilities (Maas, Buckwalter, & Kelly, 1991) and hospitals (Collier & Schirm, 1992). Several studies have examined LST decision-making by families, using hypothetical scenarios to explore LST decision-making (Bonner et al., 1999; Karel & Gatz, 1996) and exploring actual LST decisionmaking (Mayer & Kossoff, 1999; Tilden, Tolle, Nelson, & Fields, 2001). Such studies have investigated factors associated with LST decisions, such as pain and time left to live. However, they have not examined the experience of family caregivers as an aspect of their ongoing caregiving. In this article, factors identified by family caregivers as being important in understanding their role strain and ease in making LST decisions for their elderly ill relatives are described. Role strain was defined as when family caregivers felt difficulty in making LST decisions. This definition was derived from the work of Goode (1960) and Burr, Leigh, Day, and Constantine (1979). Goode defined role strain as "felt difficulty in fulfilling role obligations" (p. 483). Burr et al. viewed role strain as relevant to understanding family processes. Strain is often used in family care literature to describe experiences of caregivers caring for elderly individuals (Archbold, Stewart, Greenlick, & Harvath, 1990; Given & Given, 1996). Ease was defined as family caregivers' feelings of being without discomfort in making LST decisions (Hansen, Archbold, & Stewart, 2004). This definition was derived from the data to capture neutral or more positive aspects of making LST decisions. Purposive sampling was used to ensure the sample included family caregivers with a broad range of experiences in making LST decisions. Seventeen family caregivers whose ill relatives had recently died participated in the study. Caregivers ranged in age from 26 to 85 years (M = 59.2, SD = 14.7). Table 1 contains additional participant demographic information. For one deceased elderly relative, two family members participated in the same interview. The 16 deceased elderly relatives ranged in age from 67 to 92 years (M = 81.4, SD = 9.0). Twelve were women and 4 were men. They had had a variety of primary diagnoses, including cancer, coronary artery disease, dementia, and stroke. Eight had LSTs withheld, 7 had treatments withdrawn, and 1 had treatments both withheld and withdrawn. They had died in hospitals (n = 9), assisted living facilities (n = 3), a retirement home (n = 1), a vacation house (n = 1), an Alzheimer's unit (n = 1), and a hospice facility (n = 1). After the Institutional Review Boards of three major health care institutions approved the study, the sample was obtained through health care providers. The providers identified family caregivers who had participated in making LST decisions for a deceased relative during the past 6 months. The health care providers gave data on the type of LST decisions made, the providers' perception of family caregivers' experiences in making such decisions, and the characteristics of the deceased relative. From these data, a list of 23 potential participants was developed based on type of LST decision, family caregiver gender, minority group status, and characteristics of the deceased relative. The health care providers then telephoned the 23 caregivers, briefly explained the study, and invited them to participate. Of the 23, providers could not reach 3, 1 was lost to follow-up contact, 1 declined participation for unknown reasons, and 1 was discouraged from participating by another family member. If a caregiver agreed to participate, the health care provider gave the caregiver's name and telephone number to one author, who then contacted the caregivers. One author conducted semi-structured interviews with all family caregivers 2 to 8 months after the relative's death to obtain descriptions of caregivers' experiences in making LST decisions for their elderly ill relatives. The interviews ranged in length from 36 to 128 minutes (M = 68.8, SD = 29.0). Interviews were tape-recorded and transcribed, then verified for accuracy and completeness by the authors. Content analysis was used to analyze the transcribed interviews (Krippendorff, 1980). To ensure reliability in the coding scheme, segments of four interviews were coded independendy by two of the authors, and two other interviews were coded by two doctoral students with experience in qualitative data analysis. Full agreement on the coding scheme was reached through discussions among all coders. Inter-rater agreement on the codes was calculated at 92.2%. Factors within each of these roles may affect the strain and ease felt by family caregivers (Table 2). Such factors occurred in three time periods - before the decision-making (antecedent factors), within the decision-making period, and after the decision-making but prior to the ill relative's death. Strain and ease were influenced by both historical and immediate antecedent factors, including ongoing caregiving by family members. In each time period, more of the factors identified were associated with ease than with strain. In addition, the preponderance of factors associated with ease occurred before the LST decisionmaking. During the LST decisionmaking process, interactions among the four key roles occurred. Historical antecedent factors, such as the family caregiver's knowledge of the elderly ill relative, evolve during a long period of time. Immediate antecedent factors, such as the type and severity of symptoms experienced by the elderly ill relative, evolve during a short period of time or developed around the time of LST decision-making. I think it is easier to think of somebody dying of an accident, you know, that's more fate-ish than something you know is curable. It's really hard to see your parents die of pneumonia. I wanted an extra shot of treatment you know, I've seen it twice in my parents when they have been with pneumonia. They get a dose of fluids, get a dose of antibiotics, and then a good dose of whatever. They [health care providers] put it through the IV. I kind of wanted that one more "shot in the arm" to see if it was gonna work. But it wasn't suggested, and everybody said, "I do not think it is going to make a difference at this point." For this caregiver, strain was associated with the LST decision-making because her parents had been cured of pneumonia in the past. She wanted her father to have another round of treatment before having to make a decision. Family caregivers also experienced strain when their relatives, who were alert but in emotional distress, did not want to make their own LST decisions. One caregiver stated, "And I really didn't like the idea that my father was quite comfortable with that somehow I was going to choose when he died." Family caregivers experienced strain when health care providers downplayed caregiver concerns about the type of treatment their elderly ill relative was receiving. Strain also occurred when the elderly ill relative was treated more aggressively than expected by caregivers. One daughter expressed her concern by stating, "I was concerned about the treatment my relative was getting because there was not to be any heroic measures, any respirator..." This caregiver experienced strain because she had made a promise to her relative to have LST withdrawn if ever the relative was receiving it. Her wish to withdraw LST from her relative was not supported by health care providers. Figure. The Family Caregiving Process in Making Life-Sustaining Treatment (LST) Decisions for Elderly III Relatives. And totally, very honestly that was so much harder than anything else that had happened. I cried so much over putting them [parents] in separate apartments [care facility]. It was just terrible. Nothing else has been anywhere close. A positive relationship between the family caregiver and other family members prior to the LST decision-making was often associated with caregiver ease at the time of the decision. In addition, "knowing" the elderly relatives (i.e., their character, personality, values, beliefs, and life experiences) made the decision easier. Several antecedent factors related to the elderly ill relative were also associated with ease and including having an advance directive, level of cognitive and functional impairment, type of health decline trajectory, and symptom type and severity. Fifteen of the 16 deceased relatives had advance directives. Eight family caregivers mentioned the ill relative's pain, 5 mentioned loss of consciousness, and 5 noted struggles with everyday life. The following quotation illustrates the role that pain and struggles with everyday life might play in making LST decisions. And that, he [father] didn't, it wasn't like he had cancer and had incredible pain you know. He was very weary of life, and congestive heart failure and emphysema made everything a struggle for him. But it wasn't like he was in acute pain either. I think if he was, you know he had pancreatic cancer or something like that, I think I might have felt very differently about that. The other thing was that Dr. A really knew my father. But when he went into the hospital, he was out of the picture. There was somebody completely different, and they just started doing stuff. That was what fouled him up and what led us to the advance directive. I'm trying to deal with those [feelings associated with the decision-making] and it's reached a point where it's kind of like.... And believe me, there's six of us kids, so it should have been spread out equally. So I [daughter] need some answers. I don't want to play any more games. I just want some answers. Don't think that that's unrealistic to find out what's going on. And she [nurse] just got snottier and snottier, real just up in my face. And I said, "OK, I want to talk to a doctor. I don't care who it is. I want to know what's going on. I want to know if that machine needs to come off, because I know that she doesn't want it on." "What does your Mom normally have?" "I don't know. But her husband is in there, and he doesn't want her on that machine. And I know that she doesn't want to be on that machine. So give me the paperwork. We'll fill it out. I don't have a problem with that." "Well, we'll have to talk to the doctor." "My point!" So I left. I just left her standing there, because I couldn't talk to her any more. I was shaking. It's not my way to do that. You know, I felt bad. I apologized to everybody. Just, you know, I broke down. You're the daughter with no end; you're on the scene. I [physician] want you to be comfortable with this [decision] and feel free to call me. I'm on call tonight. But as far as I see it, we can leave him comfortable.... if he is not better tomorrow... But, if you have any reservations about that, get him into emergency and I'll support that 100%. 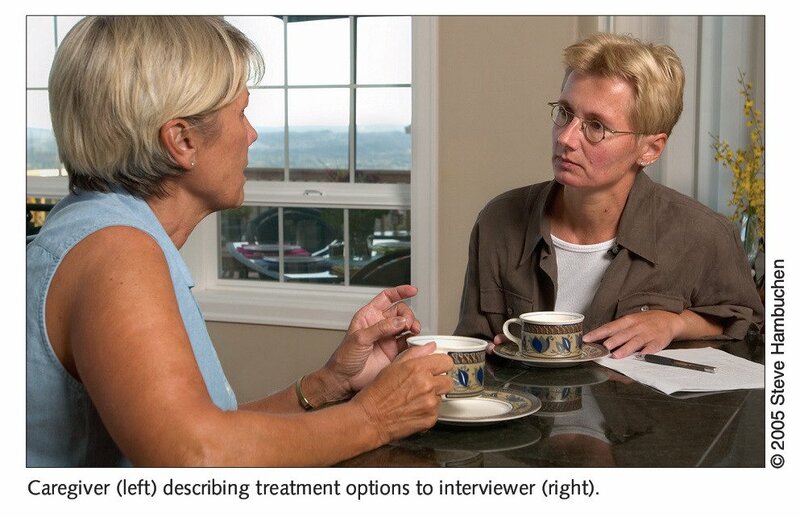 Caregiver (left) describing treatment options to interviewer (right). He [father] had been struggling with this for a week, and they [health care providers] had said they didn't know when he was gonna go. Sometimes it takes 2 to 3 weeks which is, you know, I think that's real agonizing. But I could tell that he was fighting it. You know, he just, he didn't, he wasn't ready to check out. Factors Associated with Ease. 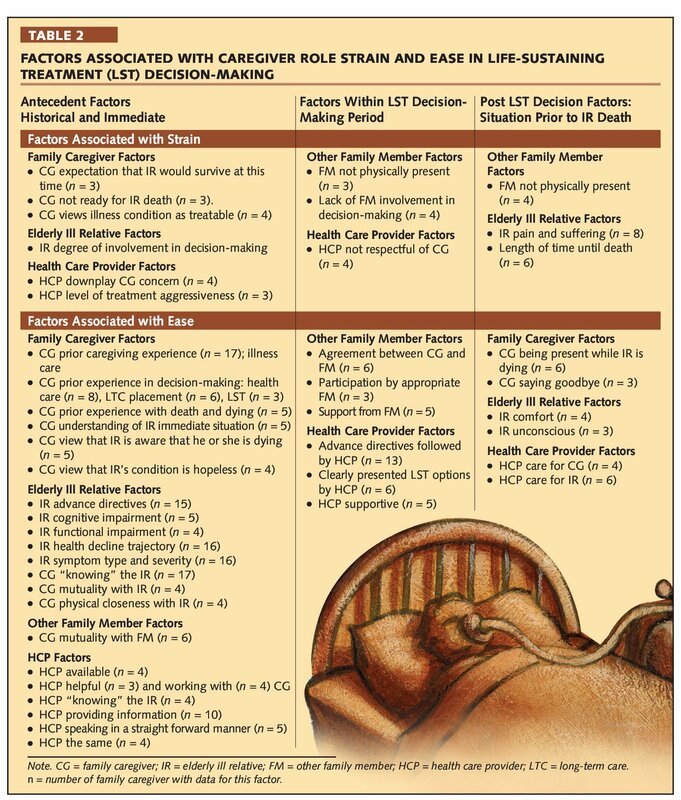 In the period between the decision-making and the relative's death, factors associated with ease were related to the family caregivers' interactions with the dying elderly relative, the state of the dying relative, and the care provided to the dying relative and to the family caregiver by health care providers. A family caregiver and his family found it easier to have made the decision because the elderly relative was not conscious. He stated, "So we kind of, all of us resigned ourselves, he wasn't very conscious then, so that was helpful." She [nurse] took the time to come back [after the LST decision-making]. And she made sure that I knew that she was on duty 24-7. She wanted to be sure that I was OK. The framework and its three time periods provide a picture of decisionmaking and factors associated with family caregiver role strain and ease in making such decisions. Surprisingly, more of the factors identified were associated with ease. Ease and the more neutral and positive influences on family caregivers making LST decisions have received minimal attention in the literature. Furthermore, the research to date on the experiences of family members making LST decisions has primarily viewed the decision-making as a discrete event, rather than as an aspect of ongoing caregiving by families. Yet, prior experiences in making health care and care facility placement decisions for an elderly individual, and family caregivers' prior experiences with death and dying may influence their feelings of strain and ease when LST decisions must be made. In particular, placing an elderly relative in a long-term care facility is a very difficult life experience for some family caregivers. Some caregivers in the current study found that decision harder than making LST decisions. Family members' knowledge of their relatives' wishes related to LSTs has been found important in making both hypothetical and actual LST decisions for relatives (Mayer & Kossoff, 1999; Tilden et al., 2001). Because these family caregivers knew their ill relatives' wishes, they were better able to follow them, and as a result, some caregivers felt more relieved. Pain, loss of consciousness, and struggles experienced by relatives were mentioned by most family caregivers. Karel and Gatz (1996) also have found pain an important factor in LST decisions. Pain control is considered a component of a "good" death (Steinhauser et al., 2000). * Time left to live. * Knowing what the individual would have wanted. Caregivers rated the parent's age, mental capacity, and time left to live less important in LST decision-making than noncaregivers did. The oldest participants rated financial strain and burden of care on the family more important in considering LST decisions for themselves than the younger generation did. The current study had a small sample (N = 17), which limits the generalizability of the findings. Further, the findings were derived from participants' recall of the LST decision-making experience, and most of the factors identified were associated with ease. The higher number of factors associated with ease may have been related to family caregivers' desire to remember what went well and to emphasize their close relationship with the deceased relative. Another explanation is that, of the 16 ill relatives, 15 had advance directives. Advance directives help families feel more positive about the decision-making (Tilden, Tolle, Nelson, Thompson, & Eggman, 1999), and therefore, participating caregivers may have experienced more ease than caregivers of elderly individuals without advance directives. The considerable percentage of deceased relatives with advance directives may be related to the focus on end-of-life care in the geographic region where the study was conducted and a greater use of advance directives in this region. In the current study, as in other studies (Tilden et al., 1999), one of the most important factors for families making LST decisions is knowing their relative's wishes. 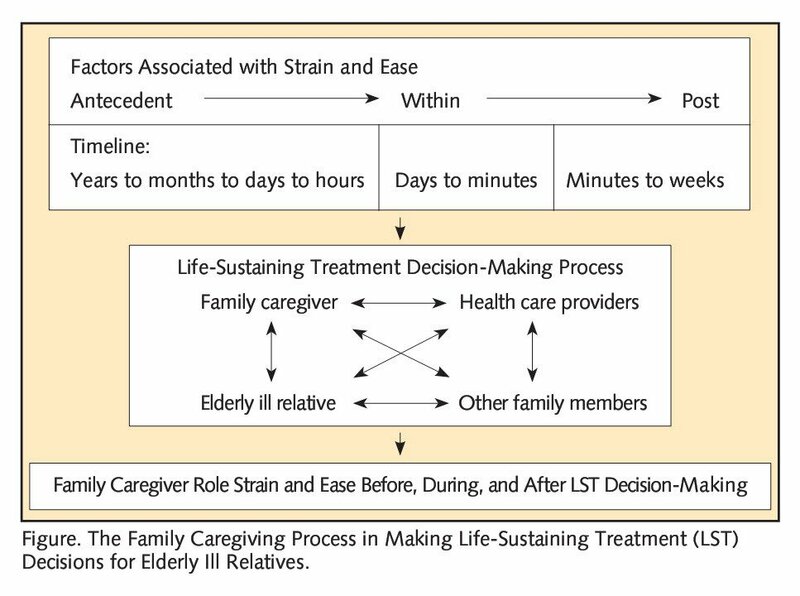 The Family Caregiving Process in Making LST Decisions for Elderly III Relatives framework and factors associated with role strain and ease in this process have implications for nursing practice and other disciplines. Before the LST decision-making time, nurses can build on several of the antecedent factors such as prior caregiving experiences and the caregivers' relationship to elderly relatives and other family members to help prepare the caregivers for such decisions. Nurses can make LST decision-making easier by being available to answer questions and by providing the information caregivers need. Health care provider factors also alert nurses to concerns that family caregivers have related to the types of LST their elderly ill relatives are receiving and the level of aggressiveness with which they are being treated. While the LST decision-making occurs, nurses can play an important role as facilitators by encouraging all family members to participate in the decision-making, helping them to support one another, and helping them come to an agreement about the decision. Another important role nurses can play is ensuring all family members understand what each of the presented LST options entails, and what symptoms their elderly ill relatives may experience when treatments are withheld or withdrawn. After the LST decision has been made, the most important role nurses have is implementing appropriate interventions in a timely manner so the dying relatives do not experience pain and suffering. Family caregivers and other family members remember and describe their relatives' death as comfortable and peaceful or as painful and with suffering. If a dying relative experiences pain and suffering after a family caregiver has made an LST decision, the caregiver may experience a great deal of uncertainty about whether or not the right decision was made. Uncertainty can contribute to greater strain. A quest for such certainty was evident in the current study and in the study by Tilden, Tolle, Garland, and Nelson (1995). Findings from the literature support the notion that when families consider LST decisions for relatives, they include their relatives' past, present, and future condition (Jeffers, 1998). The findings from this study suggest that LST decision-making is not an isolated experience, and health care providers should consider the past, current, and future condition of family caregivers who have made or are making LST decisions for elderly ill relatives. Archbold, P.G., Stewart, B.J., Greenlick, M.R., & Harvath, TA. (1990). Mutuality and preparedness as predictors of caregiver role strain. Research in Nursing & Health, 13, 375-384. Bonner, G., Gorelick, P.B., Prohaska, T., Freels, S., Theis, S., & Davis, L. (1999). African American caregivers' preferences for lifesustaining-treatments. Journal of Ethics, Law, and Aging, 5(10), 3-15. Burr, W.R., Leigh, G. K., Day, R.D., & Constantine, J. (1979). Symbolic interaction and the family. In W.R. Burr, R. Hill, F.I. Nye, & I.L. Reiss (Eds. ), Contemporary theories about the family (pp. 42-1 1 1). New York: The Free Press. Collier, A.H., & Schirm, V. (1992). Family-focused nursing care of hospitalized elderly. International Journal of Nursing Study, 29(1), 49-57. Edwards, N.E., & Scheetz, P.S. (2002). Predictors of burden for caregivers of patients with Parkinson's disease. Journal of Neuroscience Nursing, 34(4), 184-190. Given, B., & Given, CW. (1996). Family caregiver burden from cancer care. In R. McCorkle, M. Frank-Stromborg, & S.B. Baird (Eds. ), Cancer nursing: A comprehensive textbook (pp. 93-108). Philadelphia: WB. Saunders Company. Goode, W.J., (1960). A theory of role strain. American Sociological Review, 25, 483-496. Grant, J.S. (1996). Home care problems experienced by stroke survivors and their family caregivers. Home Health Nurse, 14, 892-902. Hansen, L., Archbold, PG, & Stewart, BJ. (2004). Role strain and ease in decisionmaking to withdraw or withhold life-support for elderly relatives. The Journal of Nursing Scholarship, 36(3), 233-238. Jeffers, B.R. (1998). The surrogate's experience during treatment decision-making. MEDSURG Nursing, 7(6), 357-363. Karel, M.J., & Gatz, M. (1996). Variables influencing life-sustaining treatment decisions in a community sample of families. Psychology and Aging, 11(2), 226-234. Kuhlman, GJ., Wilson, H.S., Hutchinson, S.A., & Wallhagen, M. (1991). Alzheimer's disease and family caregiving: Critical synthesis of the literature and research agenda. Nursing Research, 40(6), 331-337. Maas, M.L., Buckwalter, K.C., & Kelly, L.S. (1991). Family members' perception of care of institutionalized patients with Alzheimer's disease. Applied Nursing Research, 4(3), 135-140. Mayer, S.A., & Kossoff, S.B. (1999). Withdrawal of life support in the neurological intensive care unit. Neurology, 52, 1602-1609. Mezey, M., Kluger, M., Maislin, G, & Mittelman, M. (1996). Life-sustaining treatment decisions by spouses of patients with Alzheimer's disease. Journal of the American Geriatrics Society, 44, 144-150. Schumacher, K. (1996). Reconceptualizing family caregiving: Family-based illness care during chemotherapy. Research in Nursing and Health, 19,261-271. Steinhauser, K.E., Christakis, N.A., Clipp, E.C., McNeilly, M., Mclntyre, L., &Tulsky, J.A. (2000). Variables considered important at the end of life by patients, family, physicians, and other care providers. Journal of the American Medical Association, 284(19), 2476-2482. Tilden, VR, Tolle, S.W., Garland, M.J., & Nelson, CA. (1995). Decisions about lifesustaining treatments. Archives of Internal Medicine, 155, 633-638. Tilden, VR, Tolle, S.W., Nelson, CA., & Fields, J. (2001). 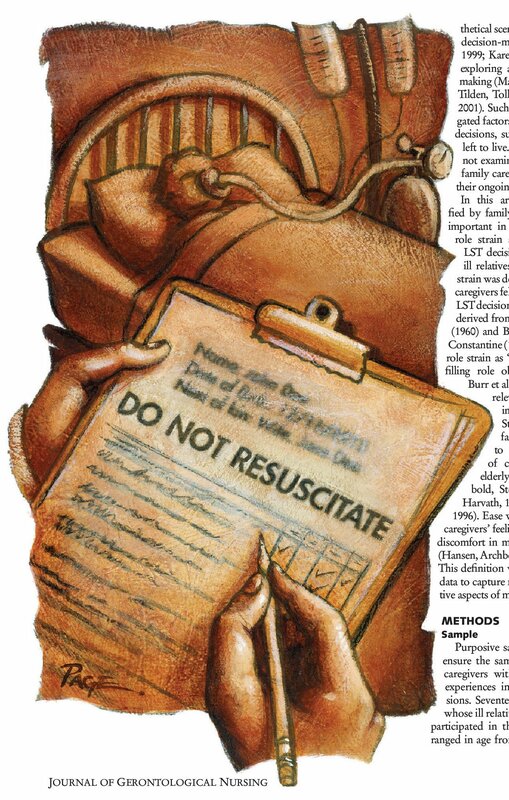 Family decision-making to withdraw life-sustaining treatments from hospitalized patients. Nursing Research, 50(2), 105-115. Tilden, VP, Tolle, S.W., Nelson, CA, Thompson, M., & Eggman, S.C. (1999). Family decision making in foregoing life-extending treatments. Journal of Family Nursing, 5(4), 426-442.